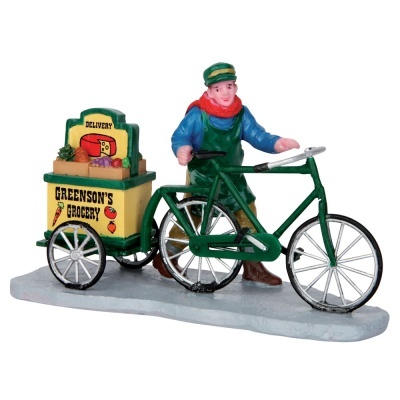 Lemax Greenson's Grocery Delivery Figurine depicts a traditional grocery boy with his street bike and delivery cart full of fruit & vegetables. A delightful Lemax figurine which joined the Caddington Lemax collection in 2015. Greenson's Grocery Delivery represents an individual hand painted polyresin figure mounted on a single street base to compliment your seasonal Lemax Caddington Village display.